Our club competition nights takes place every month, usually on the last Thursday. Epeeists have the chance to win the Kung Fu Panda trophy. The 'Gromit' is the prize for those fencing sabre. We have a maximum of 18 places available across the two competitions with regular club members taking priority. All competitions comprise of 5 or 10 hit poules, depending on the number of people on the night.The person who finishes at the top of the poule wins the trophy for that weapon. Handicaps may be used to ensure all fencers have the best chance possible to win a trophy. 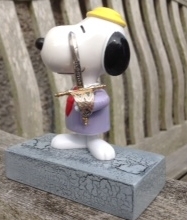 We also have a special trophy, 'Fencing Snoopy' which is for our most improved fencers and for visiting fencers. You can take part in one or (if you're feeling energetic) both competitions. All winners are listed on our Facebook page, website and Twitter feed. Please note, the trophies remain with the club at all times. Unfortunately, we can not allow the winner to take either trophy home. Please see our gallery page for photos of previous winners.